There’s no “I” in “team,” but there is a “team” in Team Poker®. Team Poker is creating what it calls a “paradigm shift” in the way poker is played. Using their patented Team Scoring System, the online poker platform gives players the option to compete solo or form teams. Team players win percentages of their prize pools based on both their individual performance and the combined performance of their teammates.With team play, the Team Poker team says, skill is more of a factor in your success. Not to mention, the experience of playing as a team enhances the social dimension of the game. It’s poker – for the Facebook age. You might be saying to yourself, “Wait a minute: doesn’t letting people play as a team make it easy for teammates to gang up on solo players?” Team Poker has a solution for that: their patent-pending Team Poker Seating Protocol ensures that teammates are never on the same table unless they are the only players at the table, either can playing heads-up, among themselves, or as the only players left in the tournament. Team Poker offers seven different levels, so you can choose the level of intensity that’s right for you. The starter “Clubs” level is free to play, while each additional level – TiP, Hearts, Diamond, Spade, Quasar, and finally Supernova – asks users to buy in for a higher cost per month. No online experience in the 21st century is complete without a profile, and Team Poker lets you create custom profiles and avatars, plus track how you rank by wins & losses or by points within your league. Looking to brush up on your skills before you play for stakes? With the Beat the Bots training program, you can practice against poker bots without the risk of losing money. Want to do some good while you take opponents for all they’re worth? The free TP Fundraising Tool™ gives players and teams the ability to compete in TP events for donations that go directly to 501(c)(3) charity organizations and sports teams. The bragging rights, of course, are yours. Team Poker is currently Beta testing its free services. The game is available for download for Windows, MacOSX, and Ubuntu, with versions for iOS and Android coming soon. 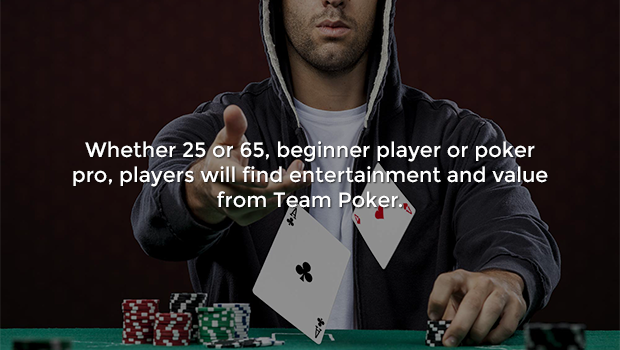 Interested players can learn more and register by heading to teampoker.com. The company is also in the midst of an Indiegogo campaign to raise funds for the site. To learn more about what’s next for the company, and access some exclusive Team Poker perks and discounts, go to the Indiegogo campaign here.